(Nanowerk News) Though quantum dots show tremendous potential in a variety of basic cancer research and clinical oncology applications, some experiments have raised the possibility that these luminescent, semiconductor nanoparticles may be too toxic for human use. Now, a review by Ron Hardman, Ph.D., of Duke University, of published toxicology studies argues that there are as yet no ways to predict which quantum dots will be toxic and which will be safe, making it necessary to test each type of quantum dot for toxicity before reaching any conclusions about their clinical utility. The review, titled "A Toxicologic Review of Quantum Dots: Toxicity Depends on Physicochemical and Environmental Factors" wa spublished in the Feb. 2, 2006 online edition of Environmental Health Perspectives. This paper is available at no charge at the journal’s website. Hardman’s review, which appears in the journal Environmental Health Perspectives, found several key points about quantum dot toxicity. The most germane finding was that not all quantum dots are alike, and indeed, that even chemically similar quantum dots can have markedly different physical and toxicological characteristics. The exact surface coating on a given type of quantum dot, for example, can influence its absorption by various tissues, its distribution throughout the body, and the way that it is metabolized and eventually excreted. So, too, can the exact size and chemical composition of a given quantum dot. One finding with particular clinical relevance was that studies examining the effects of relatively short exposures to quantum dots, ranging from 15 minutes to eight hours, were associated with minimal or no toxic effects. In contrast, toxicities were noted with longer exposures. 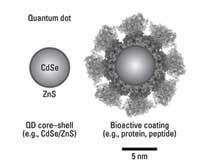 Another finding was that some quantum dots were toxic only after their surface coating had degraded, which suggests that biocompatible coatings that are highly resistant to degradation in the body might be used to create nontoxic quantum dots. Hardman also noted that quantum dots have such great potential benefits for society. To realize this potential, it is imperative to better understand potential mechanisms for toxicity now to avoid the pitfalls that would occur with the future inappropriate use of any particular quantum dot.